In today’s modern yoga world there is frequent use of sanskrit terminology and labels which can be confusing and misleading for even the seasoned practitioner to fully navigate what Yoga is really all about. For the student seeking to gain a conceptual understanding of Yoga’s hugely important end goals it’s critical they understand the purpose of their daily practices. Over the years I have studied the yoga teachings and I slowly discovered that many of the terms we take for granted in the Yoga world are often incorrectly used or their full, usually profound meaning is lost or watered down in some way. This has a major detrimental impact for earnest yoga practitioners who may not even realize what their beloved practice is all about It’s a bit like being a mountaineer but not realizing there is a mountain standing right there before you that you are supposed to climb, nor even knowing how to climb it. Imagine being dedicated to a practice and not knowing its objective and purpose. One of the most significant cases of this label misrepresentation is the term Ashtanga, you may have heard of Ashtanga Yoga which is used by a popular yoga school. This relatively famous yoga system was largely devised during the 20th century by one particular teacher who created his own specific style of really intense physicalized yoga practice. However true and original Ashtanga Yoga is something far, far more profound, vastly greater in scope and utterly more transcendental than Westerners have come to acquaint the term Ashtanga with. It may come as a surprise to know that Ashtanga is the delineation of Enlightenment into eight (astha) limbs (angas) or stages of attainment for the striving Yogi seeking to know the true nature of the Self. These eight stages are Universal as they apply to every human being, however the practices used vary from one culture, religion and one individual to another. The states of being remain unaltered. To gain a full appreciation of this new expanded meaning of Ashtanga, we need to take a step back and redefine the word Yoga, which translates to Union. Essentially the yogi strives to Unite their individual consciousness with infinite consciousness seen as the true Self or God. Yoga is often defined as Self realization or God realization by the great Gurus of India whereby our egoic awareness merges into a unified state with pure awareness. That’s a really profound undertaking and the odds of success are astronomical, so the brilliant sage Patanjali devised a step by step approach of how to realize this monumental quest. The Eight Limbs of Yoga are part of the classical treatise called the Yoga Sutras, written by the great sage Patanjali somewhere between 2,000 and 2,200 years ago depending on who you talk to. This sacred text is commonly revered as the cornerstone of all Yogic philosophy where the author effectively codified the much more ancient tradition and delineated the stages all truth seekers must go through to realize the true nature of the Self. So if you are to fulfill the goal of yoga then you need to ensure your Yoga meets the criteria of the Eight limbs of Patanjali or you are basically not really engaging in true yoga. Make sense? Niyamas – the attitude to observe – purification, contentment, austerity, Self-awareness, devotion to the Supreme Lord. Asana – ability to sit in stillness comfortably. Pranayama – ability to control inner life force or prana. Dhyana – meditation on object of higher awareness. So how did this narrow misinterpretation come about? It is my understanding from my teacher that during the early 20th century renaissance in Indian culture there was a wave of new and dynamic yoga methods that came back into vogue. As India reclaimed its Independence from the British there was a societal effort to get the youth excited about Indian traditions and heritage, one of these traditions was Yoga. From an ancient and vast tradition emerged many teachers and Gurus each with their own method, specific techniques and divergent approach to this ultimate goal of Union. Or realizing the true Self. For all the variety of Yoga methods they all had one thing in common, they had to ensure their method was in alignment with the Eight Limbs of Yoga as prescribed by Patanjali, so they often called their school Ashtanga Yoga. As my teacher Srivatsa Ramaswami said to us “back then every Yoga method was called Ashtanga Yoga”. However, one of them became popularized in the West and unfortunately everyone took the Ashtanga name to mean just this one school’s method which so happened to be only suitable for a relatively small group of people. Curiously the style of literature that was used to delineate such an important feat was intentionally cryptic and concise. Sutras are essentially aphorisms in sanskrit which are relatively easily memorized and can be chanted, meditated upon and actualized by those of deep intuitive insight. For the lay person reading a translation they are notorious for disputed and diverse interpretations, I have had the opportunity to study with several prolific teachers and every single one of them held up their favorite translation of the Sutras and stated do not read any others as they are not worth the paper they are written on! This leaves a dilemma for the Western rational mind that wants concrete answers to every question. Consequently, this differing personal bias in translation has had a huge impact on Western Yoga, namely the differing in hatha yoga styles of high profile Yoga teachers of the last century. Namely BKS Iyengar, Pattabi Jois and TKV Desikachar who happened to all have the same Guru but emphasized the teachings in very different ways. They not only vehemently disagreed with each other’s approaches, but at times their senior students have bickered in an almost sectarian way as to whose Yoga is right. From what I have learned over the years it’s critical that when studying any sacred Yogic text the translation and commentary used should come from someone with high spiritual realization if you are to plumb the depths of the teachings. This is especially true for the Yoga Sutras. True Ashtanga is not an actual system of Yoga, it does NOT prescribe specific yoga techniques but outlines the stages all seekers must pass through to realize the Self or become enlightened. Patanjali simply states those stages then provides a test once you have mastered that stage. Swami Kriyananda, whose teachings I follow stated that Sanskrit word Anga or limb is used specifically and technically to signify that all limbs of Yoga must work together for harmony. The Yogi must work on all limbs not just practice one in the dim hope that one magical day they will perfect one and move onto the next. It is worth noting that many Western people only work on asana or postures with little or no consideration for the other limbs, therefore the benefits accrued are only a portion of the possibilities available for their growth. Patanjali used the term limbs for the stages, signifying that one cannot perfect a limb of yogaYoga until all the others limbs are perfected. These stages are comparable to the limbs of a body, all eight of them interdependent. Let us first examine how one of the foremost Sages of ancient India defined the attainment of Yoga. Patanjali famously stated Yogas chitta vritti nirodha – Yoga (Union) arises from neutralizing the ego’s bias feelings. (Yoga Sutras 1:2) Every feeling, desire, attachment, resentment and self definition creates a vritti which is a little wave of energy that is trapped inside our subtle body (energy and thought). Through yoga techniques, primarily control of subtle energy and meditation we can rechannel this energy and eventually wash the Vrittis away altogether and reunite that energy with the Self. Clearly the process of Yoga is foremost an internal mental/emotional process, so merely physical transformation cannot fully transform our inner consciousness. it may facilitate some changes, but mostly the physical practices gives the student good health so that they can pursue inner transformation at the deepest level. In the presence of someone who has mastered ahimsa (non-harmfulness) all hostilities cease. The above sutra is all that is stated about the tremendously high state of consciousness of non-harmfulness whereby someone who is outwardly hostile to you upon being in your benevolent presence no longer feels animosity. There are only a handful of people on the planet with this level of Yogic advancement. Patanjali does not tell us how to realize this state of being where a hostile person or wild animal becomes a mere pussycat in your presence. Yoga Masters are sometimes pictured meditating next to a wild tiger to demonstrate this accomplishment. Ponder the reality of ahimsa for a moment, clearly this is much more than physical non-violence, ahimsa is a highly developed state of consciousness. Clearly we have some work to do! In the Yoga Sutras very little guidance is given to Asana practice, only 3 out of 147 sutras talk about physical yoga and they do only in a meditative context. The following often quoted sutra is often used to justify all of the physical yoga that goes on today, however the evidence that Patanjali was referred to hatha yoga is disputed among leading teachers. The literal translation of the word asana is seat, we must sit completely still comfortably for a period of time so that the Yogic effect of Uniting can take place. The whole point here is to transcend the body as it’s not our permanent reality. In my opinion too many people practicing yoga today are obsessed about what postures they can do and micro analysing how to do them more deeply, unfortunately some practitioners miss the point of this sutra’s standard. The fifth limb of yoga is pratyahaha – the interiorization of the sensory mind comes when the senses are withdrawn and the heart’s feelings (chitta) are calm. Until senses and emotions are calmed and withdrawn its not possible to fully concentrate let alone meditate. Reflect on the yoga classes you are taking, are they healing the senses and drawing you inwards or pulling you further into sensory attachments and away from pratyahara. In deep meditation when the senses turn inwards and we forget time and space the feeling is one of deep peace and profound joy. Are you aware of the end goal of Yoga? Ask yourself if your yoga practice is taking you in the direction of that goal? Is my yoga practice in alignment with the Eight limbs of Yoga? Every yoga practitioner correctly applying these tests to their personal Yoga practice is practicing Ashtanga yoga. Personally I consider myself an Ashtanga Yogi, but my home sadhana (practice) is about 10% postures, 20% pranayama (breath control), 20% Devotion (chanting Divine names and reading a passage from my Guru) and about 50% meditation (mantra and absorption methods). Yamas – examine your life and assess how far you have advanced in each of the 5 yamas then set goals to refine your Yamas and resist negative thought, word and action. Niyamas – strive to purify yourself especially your heart’s feelings, find contentment within the ups and downs of daily life, discipline yourself, know your own true nature and open yourself to higher reality of God or the Divine presence in any form. Asana – learn to sit still comfortably. Utilize useful yogic postures that serve your meditation practice and can lessen nervous tension, agitation and enhance circulation. Pranayama – start to feel movement of subtle energy in postures, begin to slow and lengthen the breath as a means to controlling your prana. Then crucially begin to move prana into chakras and especially to third eye point. Pratyahara – Heal your senses, bring them inwards gradually over the yoga session, the more outward the sense are the more difficult it will be to concentrate. Dharana – build drishti during asana, watch the breath in svasana and practice mantra to focus the mind. Dhyana – meditate, meditate, meditate on a object of higher awareness. Peace, love, joy, great Saint, God-realized Guru or any chosen form of God. Samadhi – absorb your self in the Self which is God, verily. Eventually there will be no distinction between and inner bliss. It is my passion and my dream to reveal the true purpose of of the ancient practice of Yoga to those seeking answers. Given all the strife in today’s world people need solutions and alternatives if we are ever going to find inner peace and harmony. Yoga as a exercise system is a good start and hatha yoga of which I practice a little every day has benefited millions of people around the world. Yet our physical yoga practice is just the beginning and so much more is waiting to be discovered but we need to re-define the key aspects of Yoga, and let people see for themselves the tremendous potential that awaits them. On Saturday Nov 11th Steven will offer a 4 hour seminar of Living the Eight limbs of Yoga. What was it like when you first opened Eastside Yoga? We had moved to Austin just a year before opening and Elsa immediately saw the potential and charm of the east side, I still remember her telling me that we needed to live and open the yoga studio east, its going to be the coolest part of town. Back in 2009 there wasn’t much going on east 11th st other than Blue Dahlia it was kind of quiet and you hardly saw anyone on the street, these days I can’t get across the street! The suite we are in lay empty for about 3 years, the moment I walked in I just knew in my heart this was the place for Eastside Yoga. Its curious we later discovered several people told me they would walk by long before we came along, look into the window and imagine a yoga studio there, in a way they helped manifest with us. On the day we got the keys, we will never forget driving up feeling nervous and excited and there was a lady with her face up to the glass looking in the window. Anita was her name, she wanted to know if we were open, then wanted to but a monthly unlimited it was a good omen. What is one of your favorite memories from the past eight years that the center has been open? About five years ago we held a Kickstarter fundraiser that some of the teachers organized for us to help complete some much needed projects at ESY, one of them being building the beautiful front desk we have. Steven is someone that doesn’t like asking for help so he was resistant to the whole fundraiser concept but when it came to the night of the event we was literally stunned by the generosity of our students, people were writing checks and handing them to me expecting nothing in return, it was overwhelming. the teachers were giving their hearts into the whole thing, offering services and yoga for free. I was lost for words. That kind of memory never leaves your heart. Over the years we have strived to honor the Yoga tradition and offer programs that allow sincere seekers to participate and experience the full spectrum of what Yoga has offer, recently we hosted a highly esteemed Swami that is steeped in the tradition, he stated that it was commendable what we are doing at ESY, hearing that from him was most gratifying. What is your favorite part of managing and taking care of the center? When you see the positive effects Yoga has on people’s health and well being, Yoga is such a wonderful system and has the potential to heal and transform our World. Its humbling to witness and know that we (the teachers and staff) made a small contribution to our community. Over the years we have come to understand that through the collective intention/energy of people Elsa and I are holding space and in a way caretakers of that intention, if we sit quietly and tune in I can literally feel that energy and try to act from that place, we don’t always get it right but its a guiding light for how I manage and make decisions. What has been the most challenging aspect of managing caretaking the center for you? When you hear from people about ESY how do they describe their experiences here? In the first couple of years we were open, several of the locals used to refer to us as the Yoga Shop which I kind of liked, then that name morphed into the Mom n Pop Yoga Shop, which is how we liked the neighborhood to describe us. Over the years there have been so many students that have commented their love for ESY, for their yoga teachers and the space we hold, we seem to have developed a reputation for sincerity and teaching to all types of people, this makes me feel kind of proud. You recently changed the name from “Eastside Yoga Studio” to “Eastside Yoga Center,” can you say more about why you made that change? What does “Center” mean to the vision of Eastside Yoga? About three years ago a visiting Yogic scholar with a big personality made a suggestion that we change the name to a Yoga Center which would better describe our vision of ESY being a sanctuary and a place of healing, the term yoga studio is a western invention and has a more of a fitness ring to it. For about two years I tentatively began to mention center and only recently after Jenn Coats encouragement we made the change. Center feels right to me. What are your visions for the future and ESY’s offering? For me the modern Yoga phenomenon has kind of lost its roots and is getting consumed by the fitness industry, a big part of the ESY mission is to teach Yoga as our teachers taught us and their teachers and Gurus taught them. Its time to bring back yoga classes that serve body, mind and spirit, its time to show people what Yoga is really about, what its goals are and the rich and beautiful tradition has to offer. The more we can teach, hold space and school students and teachers the more we serve the great Yoga Masters that brought us these teachings to begin with. This alongside finding ways to build a supportive yoga community is key, when you have fellowship in yoga sangha then the practices become a lot more accessible, together we can be the change. If you head out of our neck of the woods in East Austin, and head down to South Austin near Ben White and Machaca Road, you will come to a shady neighborhood where the kids attend Joslin Elementary School. Built in 1950’s, the school is named for Sgt. Jerry Joslin, an APD officer of 11 years to died tragically. If you read the school’s website, you will find that he was honored because he worked closely with school officials and students in organizing and directing safety patrols. This week, Steven and Finlay and I had the pleasure of meeting Summer McKinnon, the Assistant Principal at Joslin. We were connected by James Buttler, AISD’s Mindfulness Specialist who works with the Social And Emotional Learning (SEL) team to help students cope with other aspects that may affect learning. SEL is a “process for helping children and adults develop fundamental skills for life effectiveness,” so because AISD is a recognized leader in urban education this aspect of taking care to develop the whole child is of utmost importance. As you may know, Eastside Yoga has partnered with AISD to help provide support for schools who are trying to start a mindulfness program for their students and staff. You may have even donated a cushion, yoga mat or some volunteer hours in the last six months as we helped bring yoga props and decor to Rodriguez Elementary or helped create the mindfulness room at Andrews Elementary. The first two school projects were quite different from each other: Rodriguez had a large unused portable building that teachers and parents had already remodeled and we just provided some finishing touches. At Andrews, we cleaned out the Assistant Principal’s office in order to make space for the mindulness room, painted the walls with a fresh green coat and made glitter bottles to help the children focus their minds. There are so many schools who are in the participating in mindfulness in some aspect. It seems our task at Joslin Elementary will be quite different as well. Imagine an outdoor space, probably larger that the square footage of Eastside Yoga! As expected this time of year, there are some mosquitoes and some overgrown shrubs, as well as a smattering of invasive hackberry bushes. There are a few small benches, the start of a stone path/labyrinth and a few raised vegetable beds. There is a soggy area near the downspout of the rain gutter and some tattered picnic benches which could use some loving kindness. Imagine further a vision put forth by Asst Principal McKinnon and some parents who have a pond shell … picture a pond with a shaded sitting area of benches and tables, some native heat resistance plants and possibly a path that can be used for walking meditation. At Joslin, their mission is “to ensure that every student will demonstrate individual growth, development and academic success through a balance educational program…” Could this include meditation and mindfulness opportunities in a green space just outside their classrooms? We all hope so! “When you are washing the dishes, washing the dishes must be the most important thing in your life. Just as when you are drinking tea, drinking tea must be the most important thing in your life. Forget about dishes and tea. When was the last time that you fully paid attention to ANYTHING you were doing, as if it had any importance at all? Or, like most of us, were you doing something while thinking about something else? Or doing something, whichdoing something else at the same time? Just moments ago, as I was finishing up some emails and administrative work, I had mylaptop, I-pad and phone in front of me. I was looking at a text while composing an emailand I didn’t even notice until I realized I was texting on the phone while looking at my computer screen wondering why I couldn’t see what I was typing! Splitting my attention was getting me nowhere. And yet, that is so often what we do. Think about your day so far. Have there been moments of clarity, when your attentionis solely focused on one thing? Or, has your day passed by in a blur, all of the thingsyou have to do swirling together? Even waking up has become an opportunity to multi-task. My morning alarm is on my phone, so it is very easy for me to hear the alarm, pickup the phone to turn it off, and then immediately begin to scan the news. And with that,I take away the opportunity to actually wake up to myself. Instead I’m waking up to everything around me. And how about conversations you have had? Are you fully engaged, or is your head down as you text, or maybe you are thinking about something that already happened? Do you find you can’t remember what someone just told you? and we feel anxious and restless. So back to the dishes and tea. What if, the next time you are doing the dishes, or drinking tea, you allow that to be the most important thing in your life? You can try this with anything. My favorite is to eat a meal mindfully. The next meal that you eat alone, try not to do anything else. Pay attention as you prepare your food. Set a place at the table. Sit down on a chair. And eat. No phone, no TV, no work. Just you and your meal. Before you eat, take a moment to think about all that happened for you to have this meal before you. And take a moment of gratitude for that. Now you can eat. One bite at a time. Chewing before you swallow. Noticing tastes and textures and your responses to those. How do you feel as you begin to feel full? And when you feel full, stop eating. Pause for a moment and digest the food and the experience. If you are feeling up to it, then take your dishes to the sink and wash them, letting washing thedishes be the most important thing in your life! Our Yoga and meditation practices give us the opportunity to cultivate a habit of payingattention. One practitioner and one mat. Free from distractions outside of ourselves, sothat we can look at what is going on inside. Although I must say that in the past few months I have seen students take phones out of their bags and check them during class. Let’s file that under “missing the point”. Once we come to the mat, we inviteourselves into the present moment, often by a focus on our breath. It’s just in thismoment. We do our best not to bring distraction into the moment, but it’s a practice, so we are not perfect at it. The more we practice, the more we might experience thatfeeling that what we are doing is the most important thing in the world. That everymoment is the most important moment in the world. I invite you to take a break from all the multi-tasking. Make whatever you are doing themost important thing in the world, and watch as you become more present, more balanced, and more you! My first class at Eastside Yoga was July 4, 2012. It was gentle yoga, and as it turned out I was the only student and Steven was the teacher. I tried to convince Steven to cancel the class, since I was the only student, an introvert and didn’t know much about yoga. He insisted we stay and proceeded to coach me through my only private yoga class. It’s a good thing we stayed because much to my surprise 17 months later I had achieved 400 classes and was added to the “400 Club” board. Eastside Yoga has been like my second home at times. As life brought stress, the teachers at Eastside helped me breathe through it. Two years into yoga my chiropractor commented I was energetically a different person. I attribute a lot of that difference to my work with yoga. I love the variety of classes. If I feel like being pushed, a vinyasa class is on the schedule. If I need to reflect and stretch, Yin is on the schedule. If I have an injury, Gentle Hatha is the right class. The teachers fold experience, kindness and compassion into each class. I love and appreciate each one of the teachers at Eastside Yoga. I recently convinced a friend who was starting yoga to help with work stress (we are both school teachers) at the yoga studio closest to her house — to come try ESY. She quickly experienced the community of Eastside Yoga. She will be to 400 classes before she knows it! 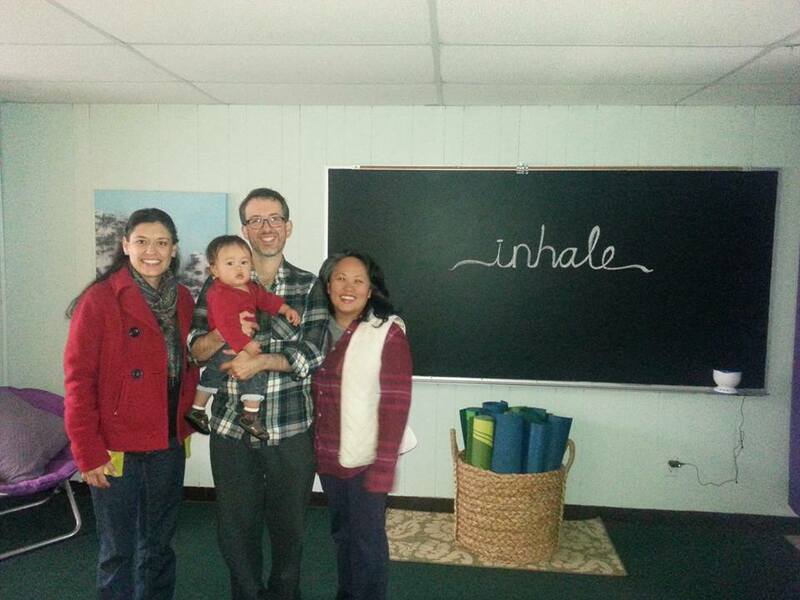 I appreciate ESY’s support of yoga in local schools. Nine years ago yoga would not have been considered in Austin schools. Now, it’s becoming an option to consider. That’s progress! It has been inspiring watching Steven and Elsa create their dream, a spiritual community where people and come together for support. Thank you Elsa and Steven. I’m grateful to have Eastside Yoga in my life. Did you know that Austin Independent School district is about to launch its first ever dedicated mindfulness and Yoga room at Rodriguez Elementary in south-east Austin? The teachers and parents gained permission to convert a once dilapidated room and transform it into a haven of peace and calm for their students. The vision for this space came from Samantha Mallard of AISD, her and her team reached out to Eastside Yoga for help and in doing so really touched our hearts and inspired us to create a service project to get the mindfulness room up and running. With several staff donating items and some late night sowing we delivered props and yoga supplies today. It was so uplifting to witness their vision coming to life. Today’s experience at Rodriguez elementary really inspired and moved us as to the potential of grassroots community involvement to share mindfulness and yoga to the next generation. As a yoga center we can do our small part to affect positive change in the well-being, behavior and coping mechanisms of these kids while coming together as a yoga community. The enthusiastic school teachers shared with us how AISD has progressively embraced mindfulness in schools to the point where they have a mindfulness guru on staff! With a growing number of teachers getting trained as facilitators they hope other schools will eventually have their own dedicated mindfulness room. We certainly hope that will happen and are reaching out to AISD to facilitate more of these service projects. If you are involved with an Austin school that might be open to creating a mindfulness room or want to help us create more of these type of service projects please reach out to us. Steven, Elsa and the ESY crew. With the US Presidential election upon us our society had been deeply agitated, it has divided people and caused stress and unease in many otherwise calm people. Personally I have been deeply affected by this election, my first as a US citizen, I have been searching for a way forward both as a citizen and a yogi. Living in Harmony may seem utopian for a modern diverse society such as the United States, however the great teachers of the East have stated over and over again that humanity’s destiny is to realize this lofty vision, eventually. For this to transpire we need personal commitment and courageous leadership. What is missing in today’s society is effectively a spiritual revolution and a sense of underlying unity in our diversity. That may sound pie in the sky to some but Yoga philosophy provides a framework for us to move in that direction. So what on earth can we do to move things in the right direction. Understanding Dharma – living in harmony through right action. For every soul that evolves dharmically is akin to a vote placed for a more evolved society, one bound by principles of harmony and sustainability. As developing yogis and spiritual seekers each one of us has a personal duty to fulfill our dharma, that is to live harmoniously with others, with nature and with the Divine. Our personal duty is to uplift our consciousness and purify our selves and in doing so this uplifts the collective consciousness, locally, nationally and globally. It is said there is a tipping point where enough individuals affect the collective to transform itself. Support each other and find sanctuary in your local community, this can be healthy friendships that transcend politics and form small meditation groups with people you connect with. In the yoga tradition we call this satsang, a gathering of those committed to truth. In this way your collective energy acts like a shield to negativity and enhances your inner experiences. For us at Eastside Yoga it is our hope that our space becomes a sanctuary as well as a practice studio. There is more to yoga than personal practice, there is fellowship love and support each step of the way. Being a yogi and a seeker does not mean you turn your back on the world, quite the opposite many Yoga Masters have been outspoken about social change, we can stand up passionately for what we believe in yet have dispassion not to be so attached to our opinions and projection of those opinions onto others. There are five guiding principles for Yogis that fit well into election season. The Yamas, restrain negative behavior. Truthfulness – Search for the truth underlying political differences, we must re-cognize our actions and remove bias. Non-coveting – avoid trying to coerce others, the more you force, the more they resist. Non-attachment – see others point of view, they have their reasons. Many wise teachers have stated we go round and round in circles trying to force things intellectually and politically but that will not transform society. A spiritual revolution is needed, yoga gives us the tools for that to transpire one person at a time. Thanks for reading, know I have my work to do on all of this , we have an uphill battle but one we have to undertake. This Friday evening ESY holds its first Community practice and Potluck, a chance to have healthy food and healthy conversation with others.